There are many difficult decisions to be made in a lifetime. Where one will go to college, accept a job, create an opportunity, build a life and more. Other serious decisions and topics for debate include: glazed or filled; cream or custard; sweet or savory; sprinkles or frosting. 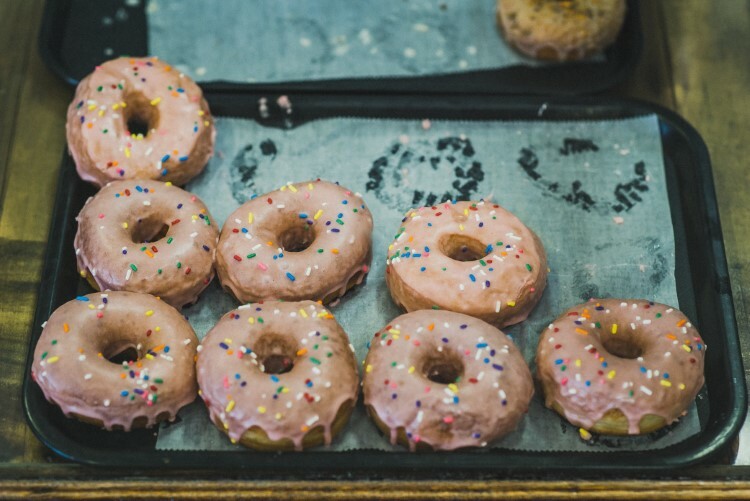 Of course, we are talking about the region's best doughnuts (or donuts), because there’s no better way to celebrate the end of hibernation season with a fresh, ready-made, handmade treat. Here are three of the region’s homegrown staples on how they make the magic of the first bite happen. The original Cops & Doughnuts in Clare now has four sister locations. The original Cops & Doughnuts location is located in Clare, Michigan. The building was built in 1896 as a bakery, and has remained a bakery under various different owners ever since. 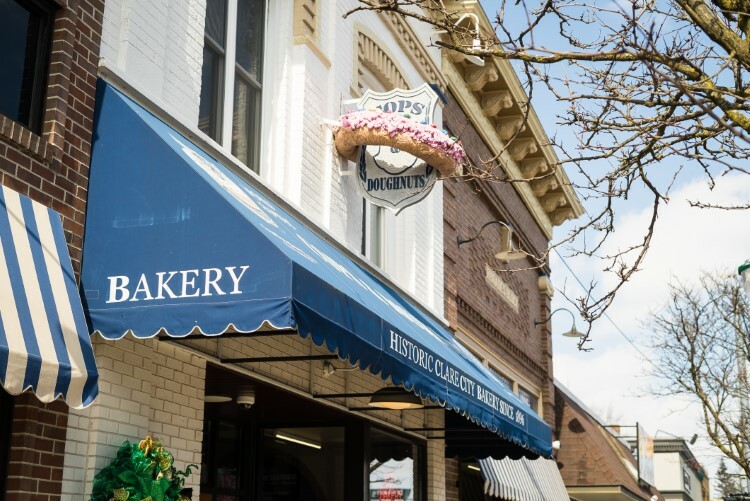 Years ago, the business was on the brink of closing when all nine members of the Clare Police Department banded together to save it, hence the name, Cops and Doughnuts. Cops & Doughnuts is a Clare staple, with many regular customers. Vice President Alan White (affectionately known as Bubba by locals) took over in July 2009. 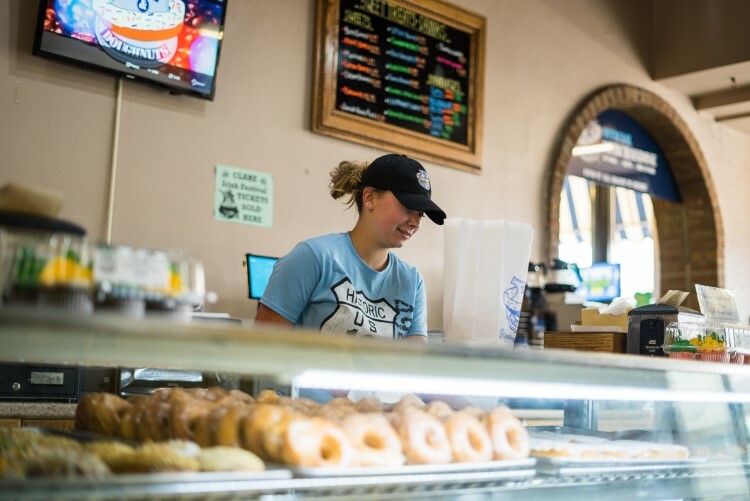 The Clare location remained the sole Cops & Doughnuts until 2015 when they were approached by a business owner in Gladwin, who asked them to produce donuts that would be offered on site. With that request, the business expanded their operation and began to drive fresh donuts to the store every morning. The Bacon Squealer: a Long John doughnut layered with two pieces of bacon on top. Their expansion continued in 2016 to included Ludington and Bay City, Mt. Pleasant in 2017, and Lansing in 2018. It is very important for Cops and Doughnuts makes everything from scratch. White says a lot of places aren’t doing that anymore. Rather, they’re buying froze rings and simply decorating. On a slow day, Cops and Doughnuts will produce 400-500 dozen and a busy day will warrant over 1,000 dozen. 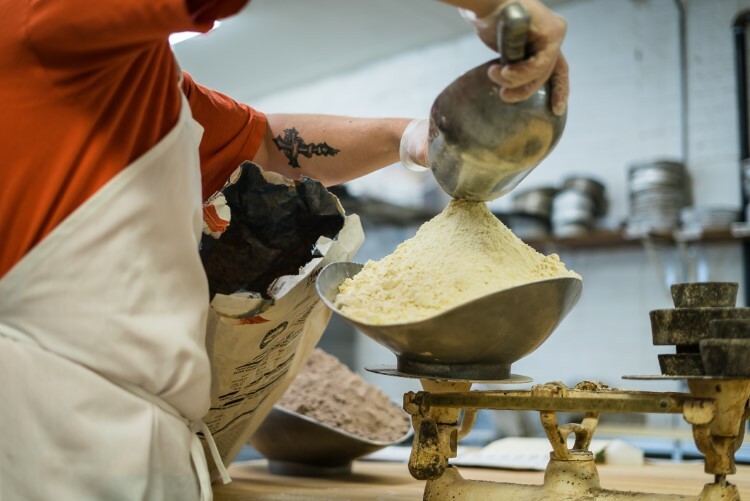 At Cops and Doughnuts, chefs take their coveted recipe and mix up 200 pounds of dough in a 140-quart mixer. Then, they cut the dough into 15-pound blocks and let it rest, waiting for the yeast to activate. Vice President Alan White, otherwise known as Bubba. Each block is then rolled out first by hand, followed by a machine, when it is then rolled into 8-foot-long by 3-foot-wide sheets. Then, Cops and Doughnuts hand cuts each one to its proper shape. Next, 24 doughnuts at a time are put on a 103-degree tray tempered to 96 percent humidity where they quadruple in size. Finally, they’re fried, filled and frosted. Cops and Doughnuts customers come in for their wide variety of favorite flavors. Cops and Doughnuts customers come in for their wide variety of favorite flavors. The most popular ones are the chocolate covered Long John with custard filling and the raspberry Bismarck. 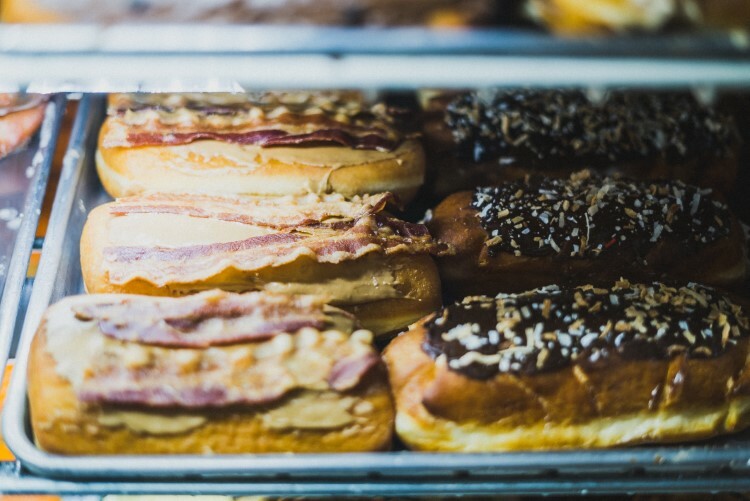 They’re also known for the ‘Bacon Squealer’, a Long John doughnut layered with two pieces of fried bacon on top and also for ‘Squealer’s Cousin Vinny’, a cinnamon roll complete with homemade maple frosting. Getting ready for the day behind the scenes at Cops & Doughnuts in Clare. The Sticky Paw daily menu. Husband and wife duo Jacob and Amber Wendt saw a need for a donut shop that made all pastries from scratch in Midland. New to the community, Sticky Paw Diner opened for business on December 1, 2018. Getting a batch glazed and ready for customers. To make the process seamless, Chef Jacob Wendt comes into Sticky Paw at 11:00 p.m. each night. Their dough is made from scratch with a homemade recipe of different flours, butter, milk and eggs. After the dough is mixed, it goes into a proofer and then is rolled into an exact size that’s measured equally all around. 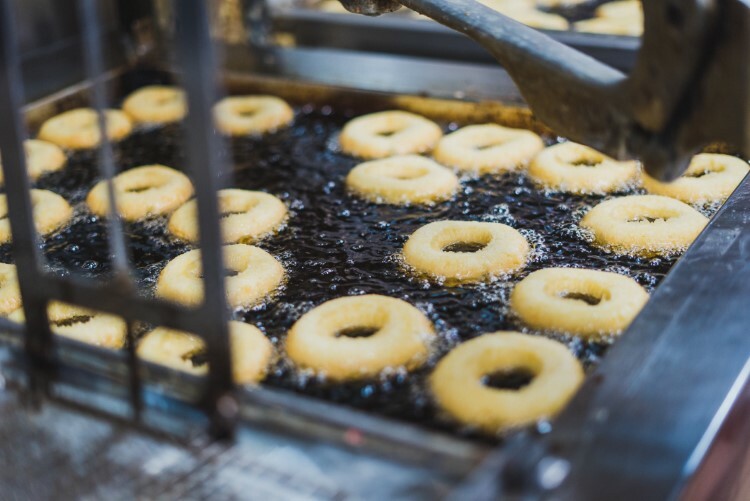 Each donut is then cut by hand and fried. 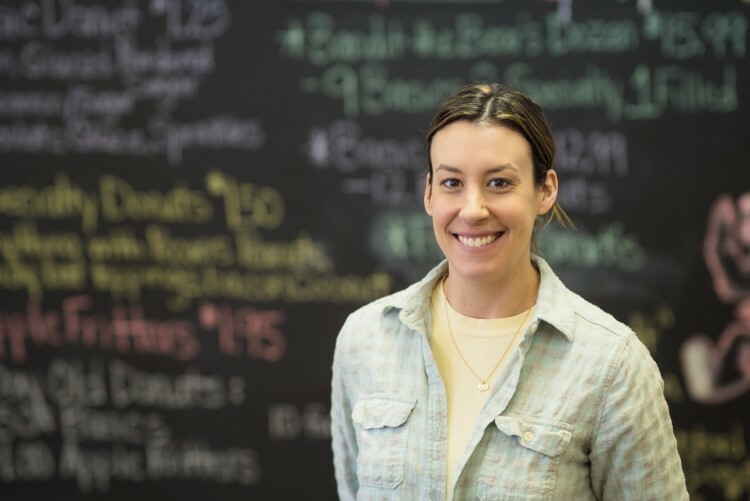 Amber Wendt open Sticky Paw Donuts and Diner in December 2018 with her husband Jacob. 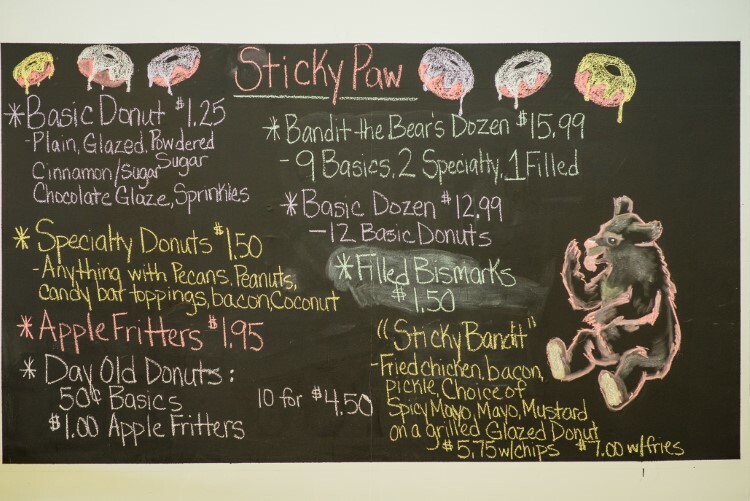 Sticky Paw also has a decorating team that comes in when the donuts are fresh to make glazes, fillings and toppings with everything is made in-house. Sticky Paw’s signature donut is inspired by their mascot, Bandit the Bear. It is a strawberry glazed donut with sprinkles, because that’s Bandit’s favorite. They also have a fresh vanilla cream filled, peanut butter cream filled, toasted coconut and chocolate glaze filled donuts. Some of the other crowd favorites include their filled Bismarcks and the apple fritters, which are made with Michigan apples. Sticky Paw Donuts & Diner is located at 3124 Jefferson Avenue in Midland. In a short amount of time, the shop has attracted a strong following of regular visitors. “Just by some of our regulars coming on a daily basis, it makes our day! To know we are doing it right, not sacrificing quality to offer the best product we can, and to gain the communal support is huge for us,” says Wendt. 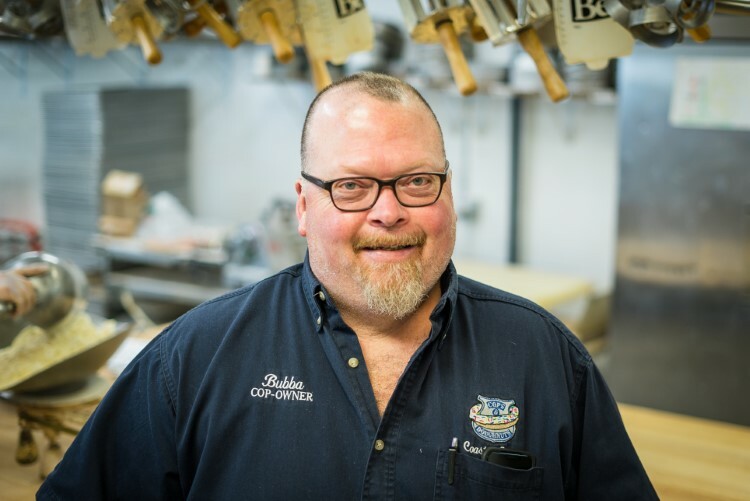 “There is a huge difference in actually making large batches of donut dough every night, and just opening a box of pre-cut, pre-made donut rings and decorating them." 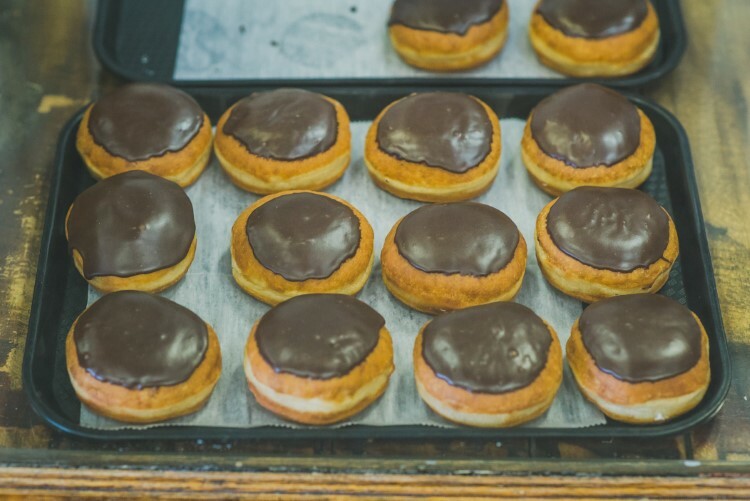 Elaine’s was a contender for Michigan’s Best Doughnut in 2014. Elaine’s Bake Shop is a full-service bakery in Bay City offering a variety of sweets, with special attention to doughnuts. 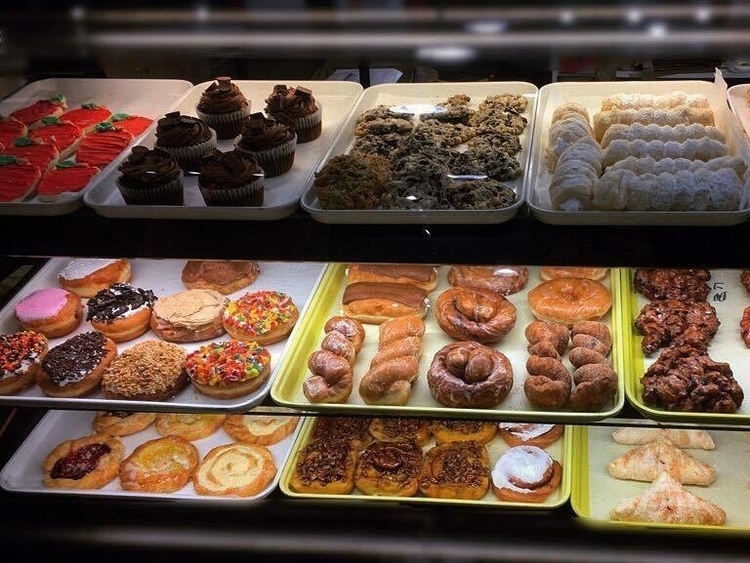 In fact, Elaine’s was a contender for Michigan’s Best Doughnut in 2014. Owner Elaine Johnson was a cook the popular Pat and Jerry’s restaurant in Auburn long before she was a baker. After years of practice and trying new recipes out on her coworkers, she gained the confidence to open her own bake shop. Johnson makes all her pastries by hand starting with her own dough recipe. 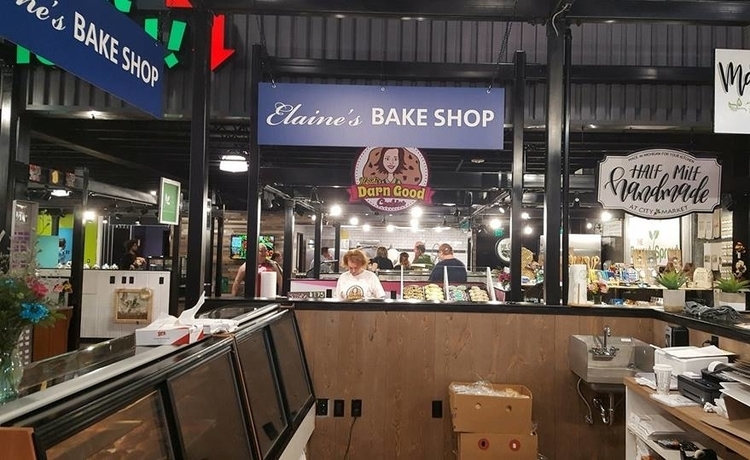 Elaine’s first location was opened in 2003 on Bay City’s east side. The shop gained traction and became a staple for morning commuters and mid-day snacks. For ten years, Elaine and her staff served Bay City’s east side community. In 2013, she moved to the west side after her landlord put the entire property up for sale, but with loyal regulars, the business didn’t skip a beat. In 2018, Johnson expanded to her second location with Downtown Bay City’s City Market. 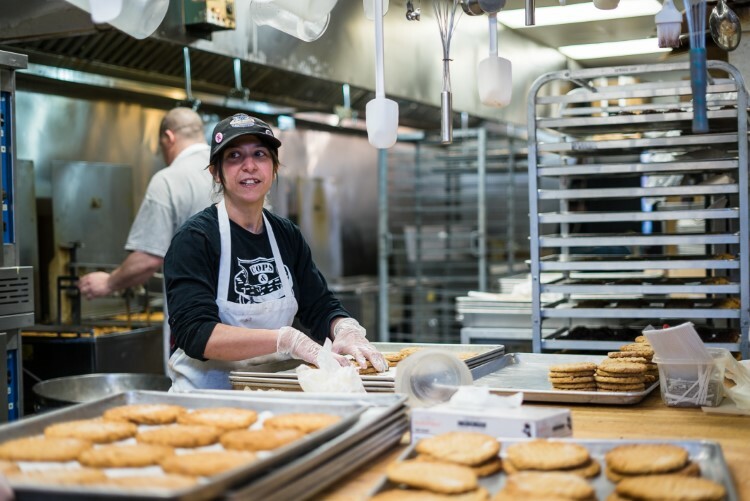 Like Cops and Doughnuts and Sticky Paw, Johnson makes all her pastries by hand. She starts with her own recipe of dough, lets it rest, cuts each doughnut by hand, puts them in the proofer, then finishes each off with glaze, filling, frosting and additional toppings. Johnson says a batch of donuts takes a good five to six hours. 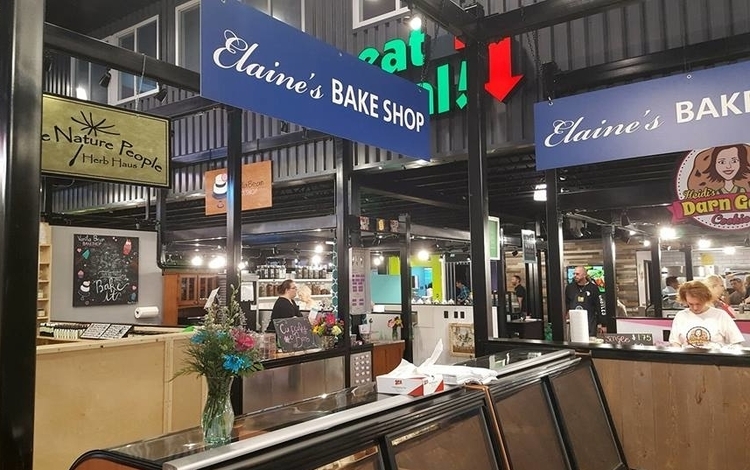 The second location of Elaine's Bake Shop opened in 2018 inside City Market in Bay City. While Johnson’s most popular flavors can vary from week to week, fritters have been a consistent staple. Every Friday Johnson offers ‘Fritter Friday’ with five different types of fritters exclusive to that day. Flavors vary based on the season and range from banana, pineapple, bacon maple, apple, blueberry, pumpkin and more. Elaine’s is home to a ton of regulars including people who have been with the business for sixteen years and still line up at 5:30 a.m. daily for their morning treat. Beyond individual orders, they also have a delivery route that spans 30 miles including Sebewaing and Unionville.